Over the years, I have gotten used to celebrating Thanksgiving. Any reason to gather with family and friends and cook and eat all day is fine by me. I love getting up in the morning and knowing that all I have to do that day is cook beautiful food and relax with my family. The day before Thanksgiving, I actually went to see a French documentary: “Step Up to the Plate” (Entre les Bras) about Chef Michel Bras and his son Sébastien. It was a great documentary, made me a little home sick of course, but the one thing that will stay with me is just how beautiful the food was. As soon as I stepped out of the movie theater, I wanted to go home to my kitchen and start “creating”. It was a little late for that so I dreamt about food all night and actually invented a recipe while dreaming (that’s a first for me!) My “dream creation” will be the topic of a future post, be patient my friends. 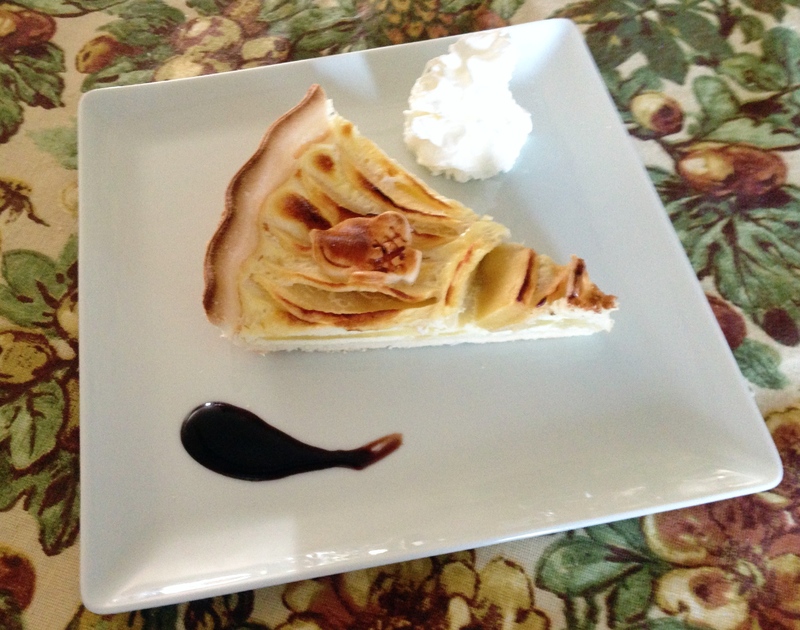 Amongst other things, I was in charge of making dessert for Thanksgiving so for this week’s recipe, I give you: the Apple Pie – French style. Pies (or tartes in French) are made a little differently than in the U.S. We usually just have crust at the bottom but not on top. So the “tarte” is the equivalent of the American tarts, There is just one word for it in French, “tarte” where in English, there are two: Pie and Tart (I know, it’s a little confusing). This recipe is very easy to make and low on sugar. It’s a great recipe to use when you have too many apples and don’t really know what to do with them. Mix flour and salt together. Little by little, add cubes of butter. Mix butter with flour using your fingers (should have a “powder” consistency). While still mixing by hand, slowly add water until creating one ball of dough. Place in Ziploc bag and store in fridge overnight. Spread butter in a pie pan. Add a little flour so that the crust does not stick. Using a little flour and a rolling pin, roll dough until it forms a thin pie crust. Place in the pie pan. Peel apples. Cut apple in the length into thin slices. Place evenly on crust (see pictures). In a separate bowl, mix eggs, half and half and sugar together. Pour on top of apples. Put in oven for 25 to 35 min or until golden on top. Radio Station: Classic 70s rock. I still think in terms of music, we haven’t topped that decade. Movie to watch after dinner: Planes, Trains & Automobiles (1987). I’m not American, but I know this one is a Holiday classic. 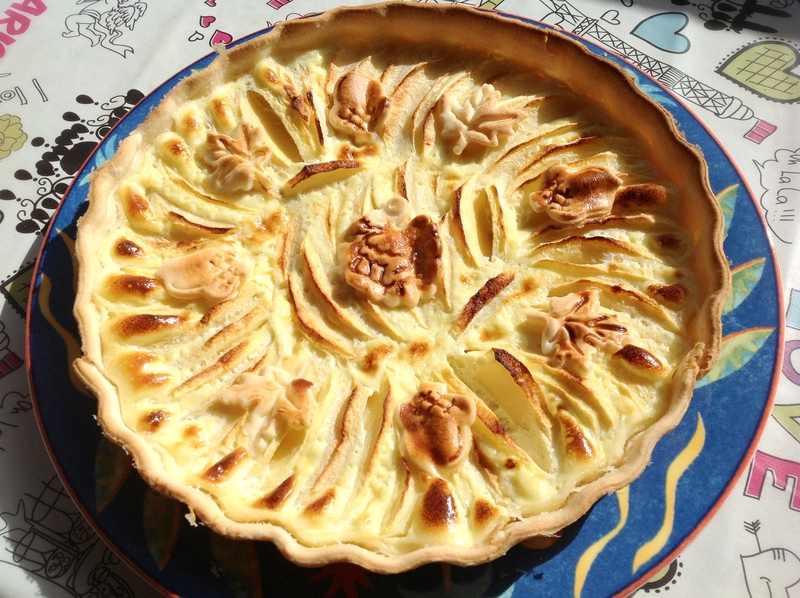 Tarte aux pommes – delicieuse! Bonne fin d’annee! C’est ma préférée! Bonne année à vous aussi! A beautiful pie! I look forward to more of your recipes! Thanks! it is very nice to “meet” you. Hope to share more recipes with you in the future. 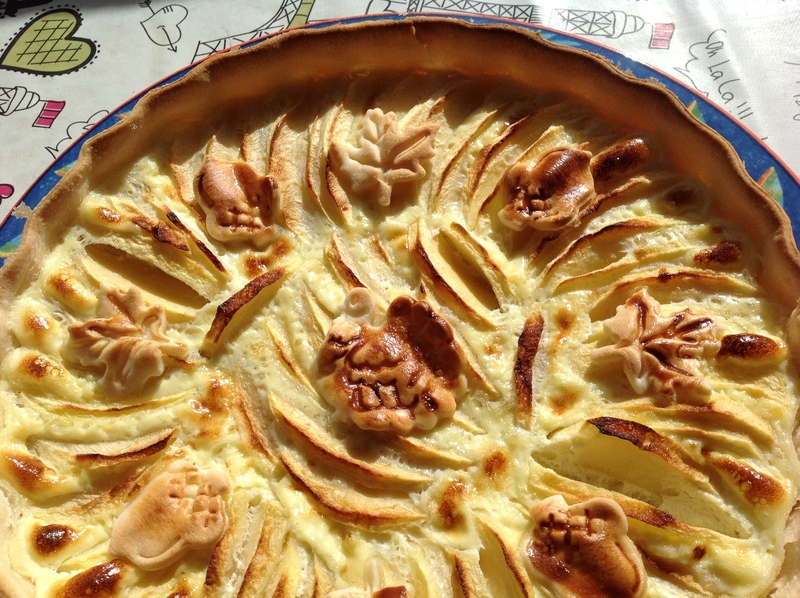 Your French apple pie looks so elegant and wonderful tasting. I can’t get enough of anything made with apple and this is just up my alley! 🙂 Happy holidays! Thanks for visiting my blog Danny. I just looked at your blog and it “sounds” delicious! Hope my recipes inspire your ongoing creativity. Happy holidays!